I feel a deep kinship with Hideo Kojima, writer and director of the Metal Gear series. Anyone who has played one of his titles can tell you that he doesn’t shy away from extensive dialogue. Many of his previous titles are replete with lengthy cut scenes and exhaustive conversations between characters. When Mr. Kojima has a thought, he takes as much time as he needs to draw it out completely. No character is too small, no topic is too obscure, and no fact is too extraneous to be neglected in the scope of his discourse. In Metal Gear Solid 4: Guns of the Patriots, characters not only talk about the mission at hand, they also chatter about their personal lives and make a great deal of small talk. There are cut scenes in this title which stretch on for more than an hour. All of which begs the question: is there such a thing as too much plot? I say never! If a developer feels they need to include three or four cinematic length cut scenes into their product and take the time to make those sequences really shine I have no problem sitting through them. The development team at Kojima Productions went so far as to include a limited amount of interactivity (such as the ability to occasionally change the camera angle) to their scenes, giving the player some modicum of control. My only problem with such extensive visual story telling is that I wasn’t supplied with a standard set of VCR style controls to go with it. There is a pause function in the scenes in MGS4, which is good because we humans have needs like thirst and hunger, but come on, guys; I’ve got some other stuff to do. I never thought that I would need to save in the middle of a cut scene, but times have changed. I have always considered cut scenes as a treat, a little bonus for the player when they complete a given task. Blizzard has always been particularly reliable for tossing in a select few pieces of brilliant animation into their games to keep us motivated. I’ve also come to expect them at the end of a title, serving as the proverbial carrot which entices us through the game. 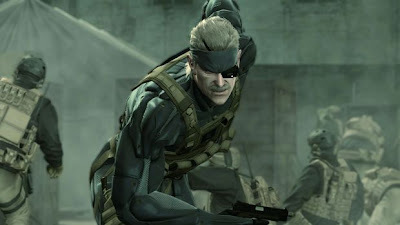 Before MGS4, I had never considered them as an integral part of the gaming experience itself. Now, having seen them utilized to such an extreme degree how will I ever be satisfied with a five minute action sequence and some scrolling text again? The plain truth is that great stories are often complicated ones. In order to thrive, they need details and subtleties and they need a great deal of them. While the storyline of the entire Metal Gear series is often convoluted, the voice acting, visuals, and gameplay are of such peerless quality that I believe they haven’t wasted a single moment of our time. COuldn't agree with you more. Metal Gear Solid 2: Guns of liberty, might just be my favorite video game of all time. I tried playing FFX after finishing MGS2 and the motion tracking and voice acting is almost unbearable compared to what Hideo achieved. David Hayter is almost a house hold name in the video game world for his role as the voice of Solid Snake! As far as I'm concerned, there is no better direction and story crafting in the video game world right now.